There is no skill more important for backcountry skiers and riders than recognizing and assessing avalanche hazard, and using well-gathered information to make safe decisions. Let our team of friendly, experienced avalanche educators help you master the strategies to make the backcountry a rewarding place to play--for an entire lifetime of powder turns. We offer Level 1 and Level 2 avalanche courses, all of which adhere to current American Avalanche Association (AAA) standards. More information and registration below. Custom course dates available for groups of four or more. Get your friends together and take a custom course! For those who have already taken a Level 1 course and want to take the next step in their mountain education, Montana Alpine Adventures is offering a yurt-based Level 2, February 2-5th, 2017. With one day of classroom instruction, followed by three days and two nights at the yurt, it's the absolute best way to learn more advanced avalanche and travel skills! $700/person. Call 406-581-5754 to register. Get a Level 1 avalanche course and a fully guided, catered yurt trip! Bell Lake's immersive, high-country environment takes avalanche education where it belongs: into the backcountry. For three days and two nights, our experienced, professional instructors take you through the tools, practices, and attitudes that are required to safely enjoy a lifetime in the mountains. 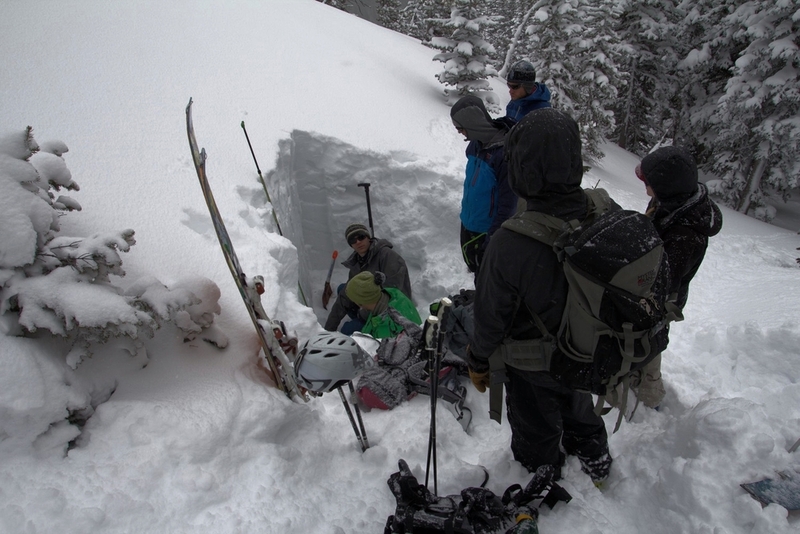 All courses adhere to current American Avalanche Association standards. With a maximum class size of eight (vs. up to 24 in other courses), students receive personalized attention and the best quality experience possible, while forging new friendships. And in order to practice our new skills, we spend plenty of time exploring, skiing, and learning in the field. Price includes professional instruction, three days and two nights at beautiful Bell Lake Yurt, all meals, a certificate of completion, and plenty of powder! See a calendar of courses HERE. Guests will need touring bindings and skins or a splitboard (no snowshoes, please), and an avalanche transciever, shovel, and probe. Gear rentals are available at very reasonable prices at local shops and through Montana Alpine Adventures, and we're happy to help set you up or success. Please call 406-581-5754 for details. NOTE: Bell Lake Yurt Level 1 avalanche courses take place in the backcountry. The approach to our yurt is 2.6 miles and 1,600 feet, which usually takes around three hours of skinning with a daypack and sleeping bag. Please be physically prepared.